(Daily Press, Newport News, Va.) -- The holiday season often brings stress along with fun, but certain foods may help your nerves -- without packing on pounds. 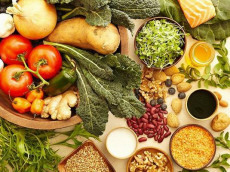 "There are foods that really do have calming properties based on how their specific nutrients are used by the body," says Gloria Tsang, a registered dietitian and founder of the online nutrition site HealthCastle.com. Work citrus fruits into your meals. These fruits are rich in vitamin C, which research has shown may help lower blood pressure and other physiological reactions during stressful situations. Oranges, grapefruits, lemons, limes and kiwis are all good choices. Switch to whole-grain carbohydrates. All carbs temporarily boost levels of the "feel-good" brain chemical serotonin, but many of these "comfort foods" -- think cookies and chips -- aren't so good for the rest of you. Go for healthier options such as whole-wheat pastas and whole-grain, air-popped popcorn. Brew a mug of hot tea. Green, black and white teas have half the caffeine of coffee but offer the same comforting warmth. They also are packed with flavonoids, natural antioxidants that may help blood vessels relax and lower blood pressure (dark chocolate and blueberries are other flavonoid-rich foods). Pick dark green vegetables. Produce such as broccoli, collard greens, spinach and kale are high in B vitamins, which may help fight anxiety. Research suggests people with low levels of these vitamins are more likely to have depression than those with normal levels. Snack on nuts. They're also high in B vitamins, as well as magnesium, a mineral involved in production of serotonin. Almonds and cashews are particularly rich sources of magnesium; they're also packed with protein to keep hunger at bay. Just watch your portion sizes. The video below will really open your eyes.